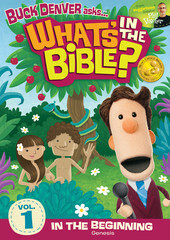 Our family loves the What's in the Bible? DVD series. The DVDs are an in depth study of the entire Bible, book by book. 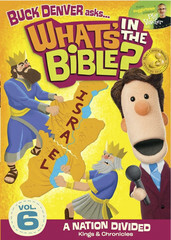 Yes, even books like Leviticus are made easy for kids to understand, without being completely watered down. The DVDs are fun and educational and are a great balance of silly kid humor and parts that are genuinely funny as well. For the past few months, we've been using these DVDs as a base for a children's Bible study that I teach on Sunday nights. The children in the group range from 11 all the way down to two babies under a year old (thankfully, one of the babies is mine and the mother of the other baby helps out with the kids as well). I think children of all ages can learn from these DVDs. In fact our two year old has repeated things she's learned and I usually learn a thing or two as well. 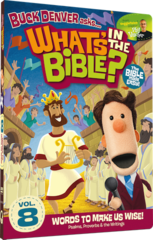 Even though we've made it part way through the series during our Sunday evening Bible study, our family is going to be using the What's in the Bible? DVDs as our Bible curriculum for this year of homeschool as well. 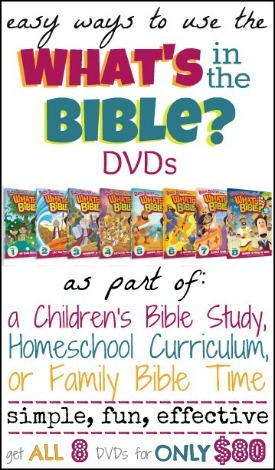 So, in case you'd like to use these DVDs with a children's Bible study, your own children as a homeschool Bible curriculum, or even as a part of your family Bible time I thought I'd share how we've been learning with What's in the Bible? I find that if I start the lesson with a read aloud it helps to get everyone focused and the kids seem to stay calmer throughout our entire lesson. Don't fall into the misconception that older children don't like being read to, from my experience, children enjoy listening to someone read a story long after they can read themselves. If you have older kids, you can get them involved as your story readers (you can help encourage then by giving them a copy of the story before hand so they can read through it first). 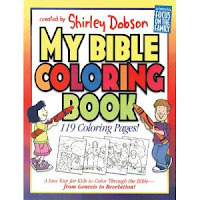 We read from a variety of Bible storybooks, mostly because some of the stories covered in the series are not the "major" Bible stories and not all kids' Bible storybooks have them all. It's also nice to be able to read the same story from two different Bible storybook since we watch the same DVD session twice. I also like to read an except of the story from the actual Bible as well. After we read the story I usually ask a few questions or make a connection between the story and our lives today. Some times volunteers act out parts of the story (the kids love this part). 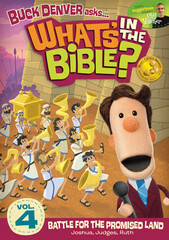 After our story time we watch the corresponding What's in the Bible? DVD episode. So far, there are 8 DVDs covering the books of Genesis through the Song of Solomon. The ninth DVD is scheduled for release in the middle of August. For one week only you can get each DVD for just $10. What's in the Bible? also offers FREE shipping on all orders over $15. 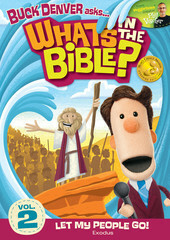 Check out all of the DVDs in the What's in the Bible? Store. 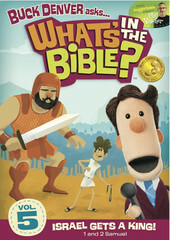 When the DVD is finished, I use the questions from the What's in the Bible? flashcards to review the information we've learned. Some of the questions may be a little too difficult for very young children, so don't feel like you need to use all of them, just make them work for you. I'll be making flashcards for all the other DVDs, too. Go ahead and subscribe for free updates so you won't miss them. You can laminate the flashcards keep each episode's cards on a different book ring or make the flashcards more interactive by having kids pick a card and read the question to the group. Non-readers can pick a card and hand it to you to read. Once we've answered and discussed the flashcard questions we usually color a picture about the Bible story or book of the Bible we learned about. As you can see, the planning of the Bible study actually takes me very little time, but the kids really enjoy it and are learning a lot. 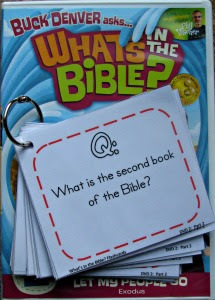 I love that even as a busy mom who doesn't have time to make up my own Bible study curriculum, the What's in the Bible? DVDs allow me to teach and impact children beyond my immediate family for Christ! 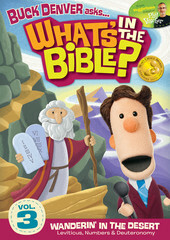 Today's Question: Have you watched the What's in the Bible? DVDs? Do you have any more ideas for extending our learning? Thanks for posting this! I've been trying to decide on a bible study curriculum to use with my young kids and have seen What's In the Bible around but this post helped me decide. I just ordered all eight DVD's and I'm super excited to follow your advice since it's working for you. Thanks again! I've never heard of this DVD study, but love the idea of EASY. I'm heading over to check it out. Thanks for the tip!